Since my front porch is covered and fairly sheltered from the elements, I like to treat it as a outdoor living room. Several years ago we bought a settee and two chairs made of outdoor "wicker" furniture (it's not wicker at all; it's a weather-proof synthetic). Ours is made by Lane Furniture, and it's very sturdy and comfortable. If you're ready to invest in high-quality porch furniture, I would certainly suggest that you check out Lane's pieces. They are of the highest quality, and I couldn't recommend them more highly. Buying the settee and chairs ate up most of my budget for furnishing this space, though, so I had to get creative with the other furnishings. I made a sturdy ottoman for almost no money. Here's how you can make one of your own. Add something heavy to the inside of the cooler, just to make the ottoman more weighty. I used old magazines from the recycling bin. Pad the cooler with foam. I used pieces of an old egg-carton mattress pad. You can pad the top only or the top and sides, which makes a nice cushy ottoman. Cut a piece of scrap wood to go on the bottom of your ottoman. Adhere the wood to the ottoman with your choice of adhesive (I used my glue gun). Cut a piece of heavyweight decorator fabric big enough to wrap your ottoman like a gift. I used about 1 1/2 yards of 54" wide upholstery fabric. Lay the fabric wrong-side-up on the floor; place the cooler right in the middle of the fabric. If your fabric is striped or patterned like mine, make sure the cooler is sitting straight on the pattern. Pull the fabric over the long sides of the cooler. Make the fabric nice and taut. Using a staple gun, attach the fabric to the wood underside of the cooler. Use just a few staples at this point; you'll add more when all sides are covered. Be sure to take your time on this part to get the sides nice and smooth. Fold and pull and re-fold and re-pull until the fabric on the two ends of the cooler is neatly arranged. I made "seam" lines in the corners (although these are not seams; they're just folds). This part is a little tricky, but remember you're just wrapping the cooler with fabric the same way you'd wrap a present with wrapping paper. Here's a tip: You'll have a good bit of excess fabric in these end pieces; cut out some of the underneath excess with scissors so your fabric will lie flat. It won't be perfectly smooth, but that doesn't matter. It may take you several tries to get the fabric to look the way you want it on the ends. When you've achieved a look that you like, pull the fabric good and tight, eliminating all wrinkles, then attach the ends of the fabric to the wooden underside. Once you have all sides smooth enough, staple the fabric to the cooler's underside several times, so that it's very firmly attached. At this point you'll have a nice fabric-colored box. See? The ends aren't perfectly smooth, but they're close enough. Choose something to use for your ottoman's feet. I purchased feet from Home Depot for about $4.00 each and spray-painted them to go with my wicker furniture. If you use feet such as this, use an electric drill to create a hole in each corner of the bottom of your ottoman. Then simply screw the feet into place. Alternatively, you can use just about any kind of block that will attach securely to the bottom of the ottoman. Turn your ottoman right-side-up to make sure it's steady on its feet. Now sit down and put your feet up--you've created a lovely piece of porch furniture for very little money! 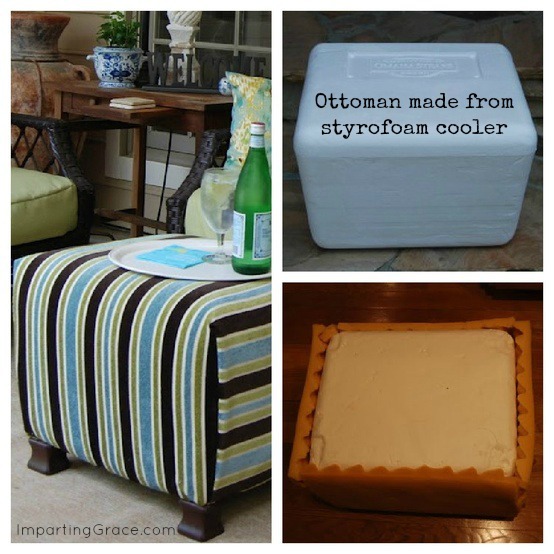 If you have a heavy-duty box or crate or even a cooler, you can create your own ottoman! The possibilities for customization for this project are practically endless! I'm joining these fun parties. Check them out for lots of inspiration! You are very clever. That looks great. I think I have that same fabric on a table runner. I found you over at Centsational Girl's party. I am your latest follower. I would love for you to come and check out my blog and follow me back at www.diybydesign.blogspot.com. Thanks so much. Richella, aren't you clever. I love it. I love your outdoor room. I love my sun room, but would love a room that is open to the outdoors, too before it gets real hot that is. Thanks for joining my party! What a great idea . . . I have tossed a few of those coolers out in my time. Clever, indeed. Brilliant! Love it-- pinned to my pinterest. This is a great idea! I have several of those coolers in my garage. I just might make one of these! Thanks for sharing! Absolutely BRILLIANT!! I'm in search of a sturdy styro cooler now! For my living room! BWAHAHAHA. Thanks for sharing! Found you via Centsational Girl, by the way! 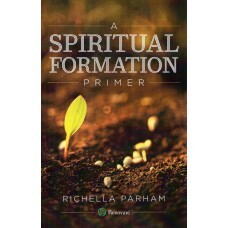 I love this idea Richella! It looks amazing. Thanks for the tutorial. This is one of the best ideas I've seen in a while! Brilliant! What a creative idea. It turned out great!! Great job. Cool project, and does not have to be limited to porch furniture! I love this idea!!! So clever you are! very, very clever! I am passing this idea onto a friend who is looking for an ottoman...she will love it! Well, bust my buttons! Thanks so much for sharing. I have a bazillon of these, and get more each day! Tired of them stacking up! Now I am going to make three for my living room, and several for my decks!!! Thinking I'll make fitted covers though to save on fabric. Cool faux leather, with eyelets and lacing up the corners? oh my word - taking a styrofoam cooler and turning it into a beautiful ottoman- what imagination you have. You should get an award for this. Very smart! And I have one of those coolers! Very clever my friend!!! What a great idea and your patio looks amazing. I think I posted something last time you posted pics of your outdoor living space, but I just have to tell you again how much I love it! It looks so relaxing! Oh, so now you make furniture too? You are too clever for me. That's just amazing creativity. To date...I think this is one of the coolest, unexpected makeovers I have ever seen. I am not just saying that cuz you say I'm so wonderful :). For you to see an otto(wo)man in a foam cooler takes SOME imagination, girl! 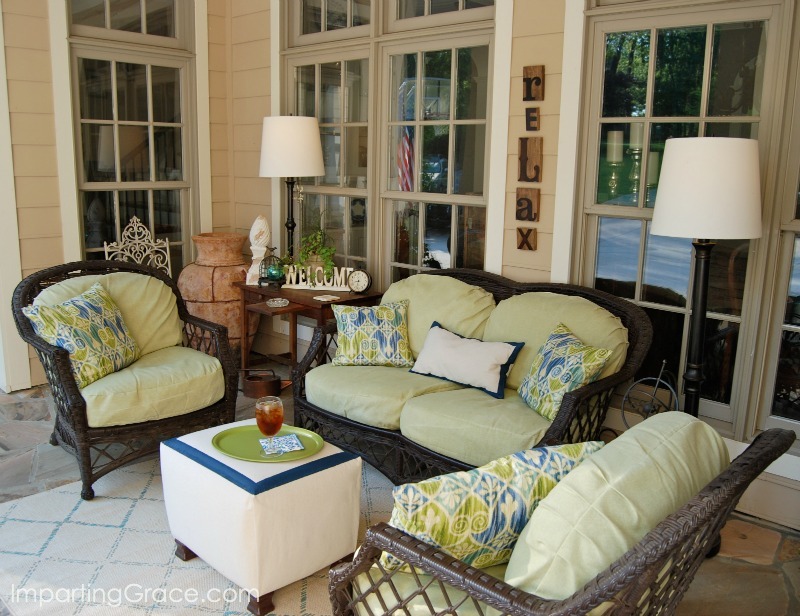 Your porch is cozy and charming--shall I come with lemon bars and sweet tea? What time? IMPRESSIVE! :) but i've never heard of those kind of coolers - where can you buy them? That is so cool. I'm amazed that you made an ottoman out of a Styrofoam cooler! That's just insane, but very awesome. I will have to bookmark this for when I graduate and I'm too poor to buy furniture for my place. I can't believe how good it looks. I probably couldn't make it look that good. I would certainly try to, though. That is such a great idea! And your patio is beautiful. Thanks for sharing. I remember seeing this the first time and I'm still completely amazed by this. It looks soooo goood. In fact, I totally brag on you for this project when I'm talking about my favorite blogs. I love the feet you added. It looks like it came with your furniture. I loooooooove it! Love this! I remember your first one and have thought about it many times since. I'm tempted to order steaks just so I can make this! Your outdoor room looks like a great place to sit and relax. Jenna, I'm glad you like the ottoman! My cooler came from Omaha Steaks. These are the coolers in which they deliver their wares. They're very, very sturdy. I'll bet you could find one at a garage sale or perhaps a thrift store. Or ask around--some of your friends might have gotten an order from Omaha Steaks and be willing to give you the cooler! This is very clever! Who would've thought that a styrobox can be an ottoman! THANK YOU for pointing out the problem with the photo! I've changed it--and I'm still blushing! Have you had any problems with people sitting on it? I would be afraid of someone sitting on it. It is a brilliant idea though! Hi jgirl--I've never had any problems with people sitting on this ottoman. I have three teenage boys, and they've sat on it many times. No problems. NOTE: You would not be able to make this out of a flimsy styrofoam cooler. The kind of cooler that comes with Omaha Steaks is just right--very, very sturdy. I just found a Omaha Steak cook in the trash! Yeah! I can finally make one of these!! I'm having issues with the folding...is there any way you could post pics of how you did the folds to get the nice seams?? Thanks!!! Rachel, the folding is the trickiest part. If you're stuck, it might help to stop and wrap a box with a piece of wrapping paper, and try to get the ends folded perfectly. Notice how you do it. Then apply that same technique to wrapping the fabric around the cooler. If you're using a cooler (or other sturdy box) with straight sides, you should be able to pleat the fabric between your fingers and pull and tug on it until it's pretty flat. It's really helpful to use scissors to cut out some of the excess fabric underneath. I have a styerfoam cooler and would like to try this project but I would like to have the lid of the cooler to be removable so I can store stuff away. Could this be possible to do? Gina, you could certainly try that! You would just need to upholster the lid separately from the base. I suggest you take a look at your cooler and see if it looks as if the lid would still fit properly on the base if there were fabric on both pieces. You might be able to help the lid sit securely on the base by adding some Velcro strips to the two pieces. If you're able to do it, I'd love to know about it! Good luck! This is amazing idea, simply loved it. Please share more idea to make more stuff out of Styrofoam cooler box. This is brilliant! Checking out the Internet to find ways to reuse styrofoam and you have the best idea yet!